Right lateral view of skull of Green sea turtle, Chelonia mydas. (Tullie House Museum & Art Gallery, Carlisle.) Note: the skull has no holes behind the eye. Skulls seem to come in three, possibly four, forms in terms of temporal fenestrae. And the animals with these forms took the name of the type, or absence, of the fenestra: Anapsids (an + apsid = no arch) belonged to the group (which include our turtles and tortoises) which appear never to have had a fenestra. Synapsids (syn + apsid = fused arch), to which we ourselves belong, have only one temporal fenestra. Diapsids (di + apsid = two arches) contain the group with two fenestrae behind the eyes. The synapsid condition is represented by the Lower Permian caseid Cotylorhynchus (Synapsida). The anapsid condition is represented by the Lower Periman amniote Captorhinus (Romeriida). The Pennsylvanian araeosceloid Petrolacosaurus (Diapsida) illustrates the diapsid condition, whereas its close relative, Araeoscelis (Diapsida) illustrates the euryapsid condition. (Eurypsids are now considered to be secondarily anapsid; that is, they are diapsids with their temporal fenestrae fused over. The group is not natural, having arisen from several ancestors. It is comprised of the Mosozoic marine reptiles ichtyosaurs, placodonts and plesiosaurs.) Abbreviations: Bc, braincase; E, epipterygoid; F, frontal; J, jugal; L, lacrimal; M, maxilla; N, nasal; P, parietal; Pm, premaxilla; Po, postrobital; Pof, postfrontal; Prf, prefrontal; Pt, pterygoid; Q, quadrate; Qj, quadratojugal; Sq, squamosal; St, supratemporal; T, tabular. Scale bars equal 1 cm. Diagram from the Web Tree of Life Project (tolweb.org). Skull of Dimetrodon. 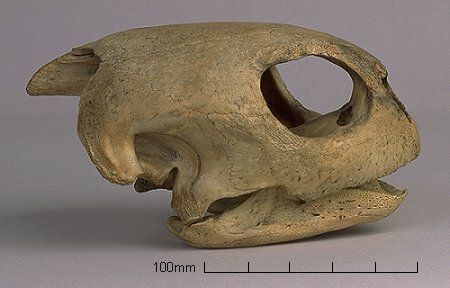 The temporal fenestra (showing that it is a synapsid) is clearly seen behind its eye socket. Synapsids were the precursors of mammals. The single temporal fenestra (on each side) is clearly seen in the famous Permian sail-backed predator Dimetrodon. In later synapsids (such as the therapsids and mammals) the sphenoid bone has expanded to close the opening. This has left the lower margin of the opening as an arch extending from the lower edges of the braincase. In other words the lower part of what used to be the temporal fenestra in earlier synapsids is now our cheek bone (the zygomatic arch). In humans and other mammals the sphenoid bone covered up the temporal fenestra. The only evidence of it is the cheek bone (the zygomatic arch), not labeled here. 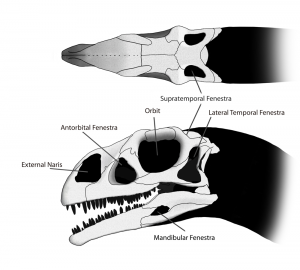 Diapsids have two temporal fenestrae–the supertemporal fenestra (or upper temporal fenestra) and the infratemporal fenestra (or lower or lateral temporal fenestra). The fenestrae functioned as anchors for jaw muscles. 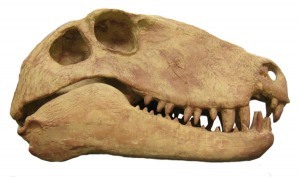 As time progressed, the temporal fenestrae of synapsids and diapsids became more modified and larger to make stronger bites and more jaw muscles. Dinosaurs (diapsids) have large advanced openings and their descendants, the birds, have temporal fenestrae which have been modified. Dinosaurs (including non-avian theropods and their descendants the birds) had numerous other fenestrae on the face and jaw. These served to lightened the skull and jaw without reducing their strength. In rare cases a fenestra in the skull was used to house a gland. This skull of the dinosaur Massospondylus shows the two temporal fenestrae typical of diapsids. 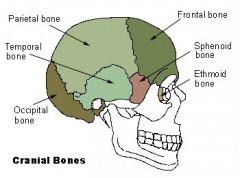 The openings in the skull are important evolutionary dividing lines because major “architectural” differences cannot be repeated in different lines of descendants. Once such a structural difference becomes fixed in a group, it doesn’t go back (or at least it doesn’t go back in the same way that it was). So there was a great deal of confidence that anapsids, synapsids and diapsids represent different groups for purposes of evolution and classification. It is thus possible to see synapsids as having separated from the rest of the amniotes (called sauropsids, meaning the group that included the later anapsids and diapsids) first. This happened 250 Ma (million years ago), during the Pennsylvanian part of the Carboniferous Period of the Paleozoic Era. According to this thinking, the diapsids then separated into two groups: the squamates (which include lizards and snakes) and the archosauromorphs (the ancestors of the archosaurs). This probably happened sometime in the Late Permian Period, although the first squamate fossils are not found until the Triassic. Archosauromorphs eventually lead to archosaurs (rhynchosaurs having branched off). Archosaurs differ from other diapsids by having a fenestra in front of the eyes, called the antorbital fenestra. (The skull of the Early Jurassic South African prosauropod Massospondylus, drawn above, clearly shows the antorbital fenestra.) Archosaurs thereafter are divided by things other than skull. It is the construction of the wrist (and consequently the pelvis) that separates the one line of archosaurs, the crurotarsans on one side (which include some bipedal predators and other fossil relatives of the crocodiles and their modern descendants) and avemetatarsalians, or ornithodirans, depending on your taste (which include pterosaurs and the dinosaurs and their descendants the birds). Sketch of fossil of Odontochelys semitestacea by Conty (Wikipedia). Click to enlarge. The skull architecture explanation was so neat and common-sensical that it inevitable would prove problematic, as indeed all neat one-trick morphological things often do. Part of the problem is the bizarre adaptations of turtles. The shell enclosure is so successful as an adaptive strategy that it permits “primitive” skeletal features inside. The other problem with turtles is the lack of fossil evidence. This made knowing how turtles arose, whether on land or in the sea, impossible. Before 2008, the oldest known turtle was the Late Triassic terrestrial turtle Proganochelys from Germany and Thailand, dated aproximately 210 Ma. In 2008, however, Chinese scientists described in Nature the new marine turtle Odontochelys, from Triassic deposits in Guizhou, China, dated 220 Ma. Li, et al, (2008). The fossil was remarkable in one respect at least. It showed that the turtle shell originated as a bony bottom plate (the plastron), even before the top one arose. 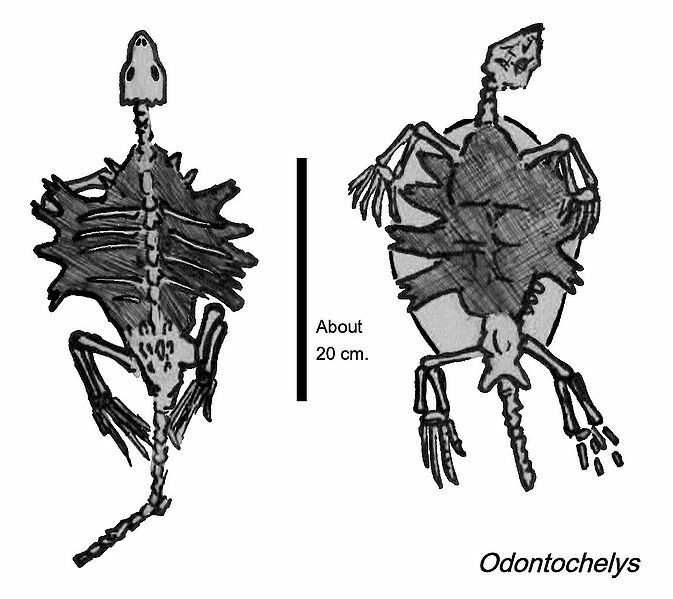 Unlike modern turtles which have bony beaks, Odontochelys had teeth in both jaws. But this latter discovery did not resolve the question of whether turtles split from the lineage leading to diapsids before or after synapsids did. As it turns out, molecular phylogenetics shows that this is a completely wrong question. The three competing theories for the evolutionary position of turtles among amniote vertebrates. (a) Morphology-1 (turtles early): the classic morphological hypothesis, with turtles branching early. (b) Morphology-2 (turtles with lepidosaurs): another morphological hypothesis, which groups turtles with lizards and their relatives. (c) Molecules (turtles with archosaurs): the molecular hypothesis, which groups turtles with birds and crocodilians. Hedges (2012). Recent genetic studies have suggested that turtles branched not from an ancestral anapsid lineage or even before the diapsids, but rather from a common ancestor with archosaurs. This would mean of course that turtles are more closely related to birds (and crocodiles and dinosaurs) than lizards. Previous studies, however, were debated because either a small number of genetic characters were tested or the number of taxa were limited. In a study published this past week, a large number of genes in 16 amniotes were tested and subject to numerous tests for phylogentic biases. The result is that turtles are firmly associated with archosaurs, as sister taxa. Chiari, et al. (2012). In other words, archosaurs and turtles (testurdines) had a common ancestor. In addition to the phylogenetic analysis, the authors also attempted molecular dating of the time of the split between testudines and archosaurs. And here, the results are more compatible with the fossil record than the morphological conjectures. Using relaxed molecular clocks methods, the authors find that turtles and archosaurs diverged about 255 Ma. (Modern turtles, they find, representing the divergence of Pleurodira and Cryptodira, arose around 157 million years ago, in the Upper Jurassic period.) The posited common ancestor is consistent with the oldest turtle as well as recently discovered early archosaurs, such as Asiliosaurus (the earliest known ornithodiran), recently discovered in Middle Triassic deposits in Tanzania and dated at 243 Ma. (or 10 million years before the earliest known dinosaur). The classic ur-archosaur, Euparkeria, lived in Early-Middle Triassic and was discovereed in deposits in the Karoo Basin of South Africa in rock dated 248-45 Ma. This phylogengy’s better fit with the fossils contrasts with the need for positing a long ghost lineage between the origin of diaspids and the diaspids and the much later appearance of turtles. Accordingly, there is a great deal of logic behind the grouping. What is means is that at a time during the Early Triassic, when large herbivorous synapsids dominated the land in Gondwana and when the top predator was the dog-like synapsid Cynognathus, the close ancestors of archosaurs and turtles had the potential to quickly exploit not only the terrestrial environment (as the crurotarsans would do, replacing synapsids as apex predators, perhaps after an extinction event) but also in marine ones. Turtles would not go on to become marine predators as descendants of squamates such as the plesiosaurs would. Instead they relied on the highly adaptive shell that they would soon develop to lead a defensive life, which outlasted most of the crurotarsans and all of the dinosaurs except the birds. Chiari, et al. (2012): Ylenia Chiari, Vincent Cahais, Nicolas Galtier, Frederic Delsuc (2012-27-7): “Phylogenomic analyses support the position of turtles as sister group of birds and crocodiles.” BMC Biology 2012, DOI:10:65 (provisional PDF). Hedges (2012): S. Blair Hedges, “Amniote phylogeny and the position of turtles.” BMC Biology 2012 10:64 DOI:10.1186/1741-7007-10-64. Li, et al (2008): Li Chun, Xiao-Chun Wu, Olivier Rieppel, Li-Ting Wang & Li-Jun Zhao (2008-11-27). “An ancestral turtle from the Late Triassic of southwestern China.” Nature 456 (7221): 497–501. DOI:10.1038/nature07533.